Jesus-Islam » Salvation » Can religion save me? When I was younger (18-22 years old! ), I often went with my friends to the beach to have a good time. But one day it was not at all funny. Everyone was trying to impress the others by their talent as a swimmer. I couldn’t swim, but didn’t admit it. It was pride. What could I do? I went further and further into the water until, when I tried to put my feet on the bottom, but to my horror, I couldn’t feel the bottom. Despite the chill I felt and the panic, I still refused to admit I had a problem. At least you know I lived to tell the tale! But, suppose that one day while on holiday, you ventured into deep water, like me, and you didn’t know how to swim. You’re on the point of drowning and you can not do anything to get out of trouble. A third person comes up and throws himself into the water, swims near you and says, “Don’t panic, imitate me. They swim round you displaying how to breathe and use their arms and legs. It’s hardly helpful! Is it really the moment for a swimming lesson? A man about to drown is absolutely incapable of learning anything. Along comes a fourth person, who, rushes into the sea, gets hold of you firmly and draws you safely back to the shore. Perhaps you try to resist him, and even struggle in your panic, but this person knows what they are doing. They keep saying, “Don’t try to do anything. Trust me.” Their concern is matched by their ability. You can trust them. They are both willing and able to save you. From then on, what gratitude you will feel for your saviour: here is someone who really understood your situation and who came to the rescue. The first three people represent religion. By nature, we are drowning in our sins, we are lost because of our separation from God. 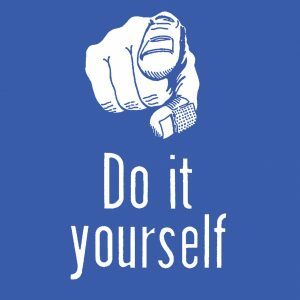 So when some religion (or even atheism) says to us: “You shouldn’t have done it!” or, “Save yourself, find the strength within!” it is in fact addressed to you as a powerless person. The third person in particular represents the followers of religion who set themselves an example or think that to be saved one must imitate some “prophet”, “saint” or “marabout” (a Muslim holy man). God has provided for our salvation in the only way that can at the same time reconcile both his love and his justice. He himself paid the price of sin: “Christ also suffered once for sins, the just for the unjust, to bring us to God”(Injil, 1 Peter 3:18). When Jesus died on the cross, Jesus died in our place. He has taken in his own body the punishment that our sins deserve. He has made a way for us to be restored into God’s favour. Raised from death, He ascended into heaven, and sat at the right hand of God. This same Jesus is now working to save sinners. Those who are saved by Jesus (by confessing their sins in repentance and accepting his offer of salvation through faith) receive the forgiveness of sins are granted the grace and assurance of having a place in heaven. So what do we say about religion? DO. It would be the attempt to do good works to please God or to live in harmony with Him. Maybe even to try and make amends for our sin, but putting religion or good works on the other side of the scales to balance things up in the hope that God will forgive and forget the past. We would never know exactly whether we had done enough. And also, since we are all sinners, any good we do has little chance of satisfying a holy God. DONE. Yes it’s done. Christ has everything that’s necessary to save us. He lived a perfect life. 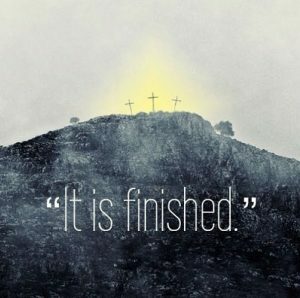 He died to pay for our sins, and He did it before we could or did do anything good. It is not enough to know this as a series of facts. We are asked to heartily accept what Jesus has done for us. If we ask him to forgive us and direct our lives, he does.